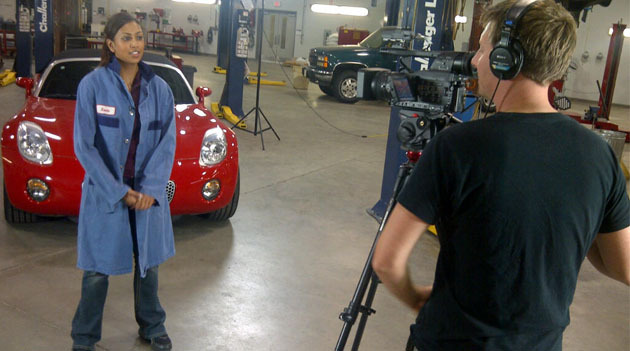 UFV student Sheetal Deo with HuStream's Jordy Starling, filming at the Trades and Technology Centre, Chilliwack. The University of the Fraser Valley just made it very quick and easy — and a whole lot more entertaining — to find out almost everything you ever wanted to know about becoming a student at UFV. By teaming up with Kelowna-based HuStream, the university has produced a new interactive video tour, now on UFV’s website. Titled Get 2 Know UFV, it consists of 17 short video clips on what UFV is really like, what programs you can take, what it costs, and how to get in. Hosted by two fourth-year UFV students, the video segments each end with a variety of buttons inviting viewers to choose what they want to learn about next. You can drill down into a topic to watch more videos, return to the main menu, link through to different areas of the website to find out more, or fill in a contact form. The interactive video tour was filmed over two days in August, at both UFV’s Abbotsford campus and the Trades and Technology Centre (Canada Education Park) in Chilliwack. View it online at www.ufv.ca/get2knowUFV. Get 2 know UFV interactive video tour is great! It”s easy to use and should be very helpful to new (and current) students! Great job!